This Instant Pot Paleo Mongolian Beef is made gluten-free, soy-free, paleo-friendly, low carb, and whole30-compliant! It’s a perfect healthier version of the classic take out dish that everybody will love. Recreating classic take-out dishes that taste *just* like the real thing is a favorite here at LCK. 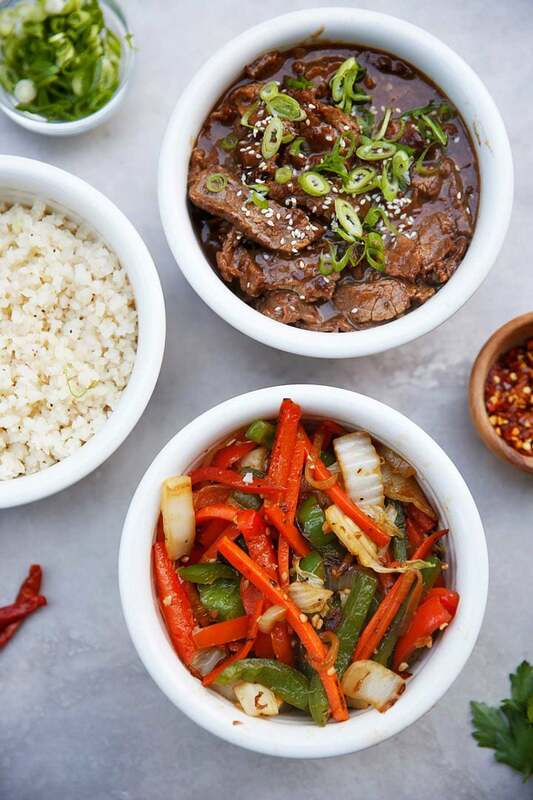 If you’ve tried our chicken and broccoli, pad thai, or slow cooker Asian beef, you know we mean business. 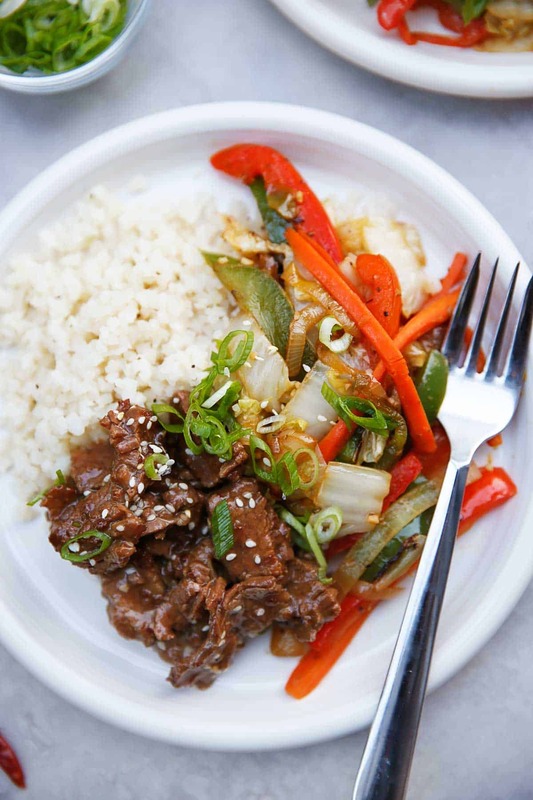 This Instant Pot Paleo Mongolian Beef is a dinner must-make! Made with tender, flavorful beef in a perfect sauce and served with cauliflower rice and delicious veggies. I also love that I can feel good about the ingredients going into this sauce! No need for take-out, this classic Chinese American dish is made healthier and quick here. What kind of meat do you use to make Mongolian beef? Flank steak is typically used, but you can use sirloin, too! Toss flank steak with arrowroot powder. Set Instant Pot to saute and when hot, add 2 tablespoons of oil. Brown flank steak, in 2-3 batches. In separate bowl combine coconut aminos, beef broth, 2 teaspoons garlic, 2 teaspoons ginger, 1 teaspoon sesame oil, fish sauce, dates and pour over beef. Set Instant Pot on manual high pressure for 12 minutes. While beef cooks heat a large skillet over high heat. Once hot, add oil and then add 1 teaspoon garlic, 1 teaspoon ginger, peppers, carrots and cabbage. Sauté until vegetables are soft and fragrant 5-7 minutes. Once soft, add 1 teaspoon sesame oil, rice wine vinegar and salt and pepper and remove to serving platter. When beef is finished, turn the knob to quick release. Top with optional garnish and serve with vegetables. *Can sub out 2 tablespoons of honey or coconut sugar if you don't want to use dates. Dates make it Whole30-Compliant. Want your sauce even thicker? At the end, add a slurry: 1 tablespoon arrowroot flour and 1 tablespoon water. Whisk together then add to the pot after step 9. Mix and let thicken. When browning your meat, if it's very thin, it may stick a little, that's okay! LExi- This looks great. I cant wait to try it. The only problem is I dont have an instapot. Will this work in the crockpot? Thank you! This looks SO flavorful! Perfect take-out, fake-out! 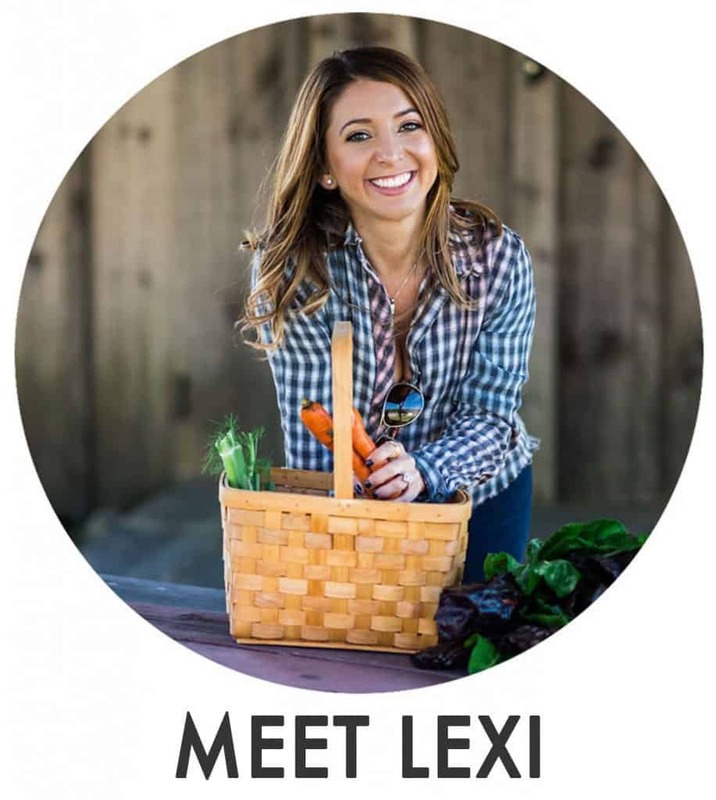 Lexi- I love all of these easy insta-pot recipes! My family would be so into this- I am for sure adding it to the line-up this week! I NEED to try this whole instant pot craze! Also, this just looks super tasty. Look at you, giving takeout a run for its money!! Totally making this in my instant pot for dinner! Looks so delicious! Yum! 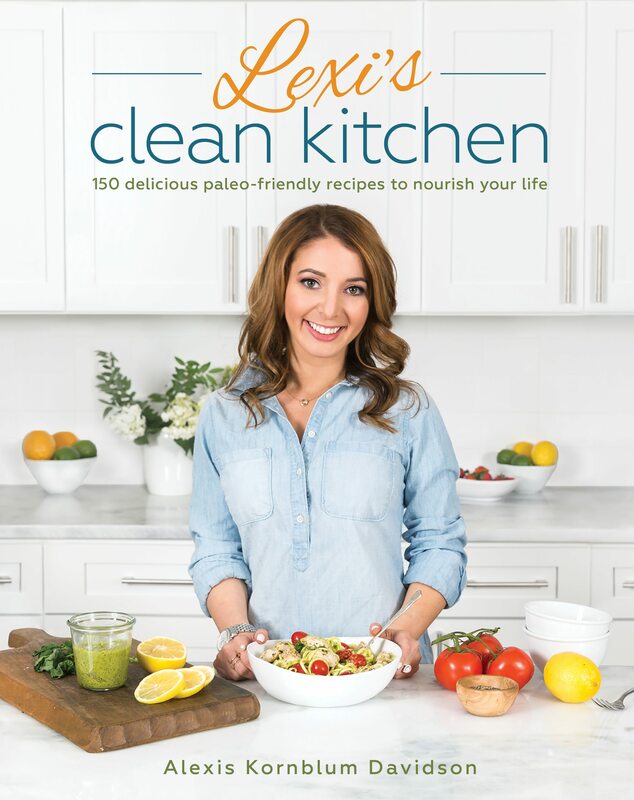 This looks fantastic, Lexi! Thanks so much for the recipe. My husband and I made this for dinner last night–holy amazing! This was soooooo good and easy! Love all your recipes, but especially the instant pot ones! Thanks, Lexi! Made this for supper & what a hit with the hubs – he went back for seconds! So much flavour & so easy. Another hit, thanks Lexi!!! This was AMAZING! Easy and tasty! This is one of my husband’s favorite dishes to order out. I’m so excited I can make this for him at home! Bonus that I can use our InstantPot!! Very good, received two thumbs up from my husband and children 😀 I did not make it in an IP because I do not have one, easily adjusted for cooking in a skillet and it was really quick. Can’t imagine how it would be quicker. I made this w a crock pot (InstanPot on my list to buy) and it was wonderful. My 14 year old, who wants to be a food critic when he grows up, said this needs to be made at least once a week. The rest of the family agrees. 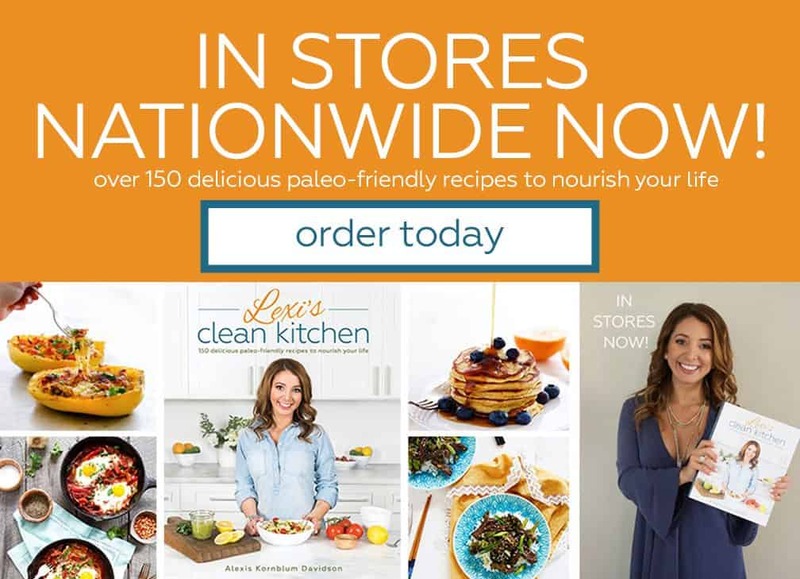 Thanks for all of your great recipes. Just got my IP today from Amazon. Your site is exactly what I have been looking for since I am now required to be a GF diet. My only question is serving size; how many people is this dish for? Also, is that the serving size for most recipes on your site? Thanks in advance. Lexi, can the fish sauce be omitted or do you have a substitute recommendation? I am new to Instant Pot, so I always browse your site for those recipes! But really, we love turning to your site daily for any recipes! Thanks for all you do! This was a huge success tonight for diner! The hubby and all three kids loved it. It’s a keeper for us! Thank you! Starting back on a Whole30 and this dish was proof again that Whole30 cooking is delicious. I had to substitute a few items but I think the dish flavor remained similar. My only complaint is that I didn’t double the recipe and there were no leftovers. This dish was AMAZING to the point that next time, I need to double the recipe because the family (2 kids/2 adults) scraped their plates clean asking if there was more! I made a few modifications to the recipe, mainly I substituted the dates with the honey as recommended and added an extra clove of garlic to the sauce because you can NEVER have enough garlic. I added some red pepper flakes to give it a little kick and it was a nice touch for the sweet, savory and slightly spicy! A little trick I’ve learned with Instantpot is to pay attention when you sauté something. Due to the domed shape of the bottom of the Instantpot, the oil has a tendency to collect around the sides and not in the middle. Anything you are browning, flank steak in this case, will certainly stick. I added an extra teaspoon of oil and placed the steak around the edges in the oil directly to coat it and then moved it to the middle so it would stick less. Don’t worry if it does stick a little because it will cook and add to the flavoring when you add the rest of the sauce mixture after you’ve browned all of the steak. This is a tasty do-over recipe for sure!!! I don’t have dates on hand. Any idea if coconut sugar would work as a substitute? Can you double the recipe? I have a 6qt IP. if doubling the recipe how long would you suggest to cook for? Looks amazing!!! I made this with chicken thighs and it was amazing. I omitted the sugar/dates and the sauce was still really good. I made it a second time with beef and unfortunately the beef over cooked. I used a different cut and different amount of beef so that definitely could be why.